The attack on UN headquarters in Baghdad, in which the Special Representative Sergio Vieira de Mello died, might have been carried out not only because the Iraqi resistance objects to all occupiers. There could have been a specific reason as well, tied to a vote in the Security Council last week. On 14 August the Council gave its approval to the recently formed Iraqi Governing Council and it also approved the establishment of a United National Assistance Mission in Iraq (Unami). The UN might therefore have been seen by the Iraqi resistance as an instrument of the United States and Britain in their occupation of the country. Whether Mr de Mello was an individual target is not known. It is comparatively rare for senior UN figures to be attacked, though lower level workers close to the action do from time to time get killed by design or accident. The most infamous killing in UN history was that of Count Folke Bernadotte who was shot by Israeli extremists in Jerusalem in 1948. Bernadotte was UN Mediator in Palestine and had angered the Jewish underground by recommending that Jerusalem become an international city. In our day and especially post 9/11 it should perhaps be no surprise that the UN should again be singled out. And those who opposed it could claim cause. By approving the Governing Council of Iraqis appointed by the Coalition Provisional Authority, the Security Council put its weight behind the move towards an eventual democratic Iraq. By setting up the Assistance Mission, the UN was throwing its influence and resources behind that same move. Whether those behind the attack were supporters of the old regime or Islamists intent on making Iraq a new battleground, the United Nations presented a target. Security Council resolution 1500 said that the Council "welcomes the establishment of the broadly representative Governing Council of Iraq on 13 July 2003 as an important step towards the formation by the people of Iraq of an internationally recognized, representative government that will exercise the sovereignty of Iraq." An accompanying report by the Secretary General Kofi Annan listed a number of ways in which the 300 strong Assistance Mission Unami could assist in that process - from helping the national political dialogue, training police, establishing a media centre, setting up an electoral process and delivering aid. 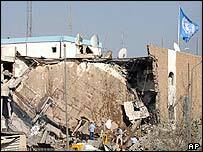 The attack on UN headquarters was not the first time the Iraqi resistance has targeted the UN. In July UN offices in Mosul were attacked and staff in the city had to be reduced for their own safety. UN flights were switched from Mosul to Irbil. On 29 June shots were fired outside the now-bombed headquarters of the organisation in Baghdad itself, the Canal Hotel. But this attack is something far bigger and is a huge blow not just for the UN operations in Iraq but for the hopes of those who want a much bigger UN role in the country. This attack might have also been intended to try to stop any greater UN presence, especially a peace-keeping force. Currently in New York, discussions are going on about how to increase the UN role. One British official said that it was a "live issue." However, it does not appear to be moving very fast. Some countries, led by France, want the UN to be much more of an equal with the Coalition Authority (that is the Americans and British). The resolution laying out what the UN should do in Iraq - 1483 - gives it a rather secondary position, for example in helping to form the Governing Council. It could advise, but the Coalition decided. In addition, many governments (India was an important recent example) will not send troops to help in peacekeeping in Iraq without a UN mandate. But if the resistance is now targeting the UN itself, then those countries will be reluctant to help even with a mandate. The United Nations was seen by many as the solution to the present crisis. This attack may force them to think again. "The UN knew it was a target... it had tried very hard to distance itself from the American operation"
"It was a pretty huge bomb"